St Clair Dental has served our community for more than four decades. 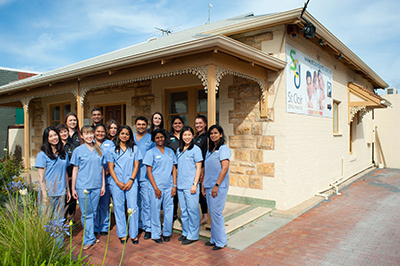 Husband-and-wife dentists Dr Anisha Sanghavi and Dr Mitesh Sanghavi took over in 2012 and transformed our facility into a state-of-the-art dental practice offering the latest techniques and equipment. Situated at the junction of Woodville and St Clair, our convenient location offers complimentary car parking on-site and is just a minute’s walk from the railway station. Our clinic is in a gorgeous, 100-year-old house, and your warm, welcoming experience starts the moment you walk through the door. We see all ages of patients, from children to retirees, so your entire family can receive the excellent dental care they need from our knowledgeable, skilled team. With years of experience, we offer a range of high-quality services, including general, restorative and cosmetic dentistry, as well as orthodontic options. Additionally, we accept health funds and are providers for Bupa, Medibank, CBHF, HFC and the Child Dental Benefits Schedule. Payment plans are also available. Contact us today to schedule your time with us! We look forward to meeting you and assessing how we can help you improve your oral health or enhance your smile.